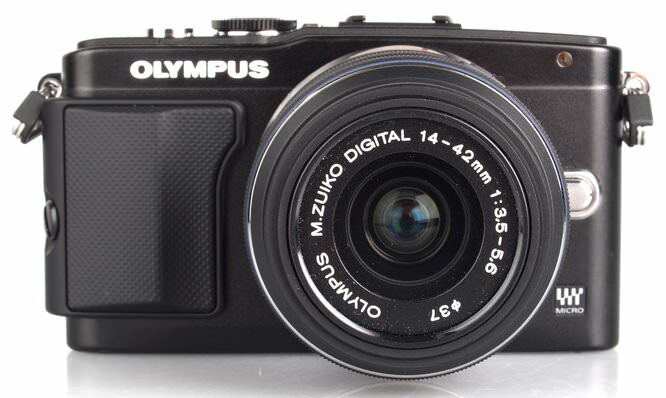 The Olympus PEN Lite E-PL5 is the latest compact Micro Four Thirds camera from Olympus, sitting above the PEN Mini E-PM2, it features the 16 megapixel sensor from the top of the range Olympus OM-D E-M5. The Olympus PEN Lite E-PL5 is the latest compact Micro Four Thirds camera from Olympus, sitting above the PEN Mini E-PM2, it features the 16 megapixel sensor from the top of the range Olympus OM-D E-M5 released earlier this year, as well as a tilting 3 inch touch screen. 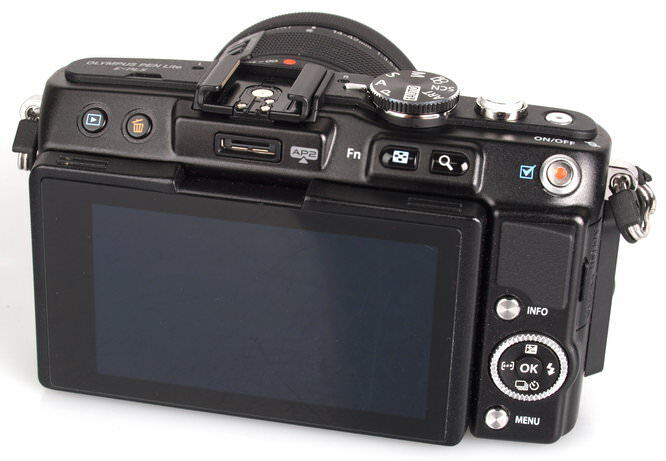 The Olympus PEN Lite E-PL5 features the same 16 megapixel sensor from the Olympus OM-D E-M5, a 3 inch tilting touch screen, 12 Art filters, and 6 Art effects, Full HD video with stereo sound as well as 8fps continuous shooting. The Olympus PEN Lite E-PL5 includes a lot of features from the Olympus OM-D E-M5, including Live Bulb / Live Time, as well as some new features including a built in HDR mode. Handling - Compared to the Olympus PEN Lite E-PL3, the E-PL5 adds a removeable grip from the E-P3, as well as a touch screen which tilts even further allowing self portraits. The front and rear grips allow a solid hold of the camera. The body is made out of metal, and the battery cover is solid with plastic over metal and features a locking mechanism. There is no built in flash, instead the camera comes with a compact pop-up flash, it is provided with a small case. The tilting screen feels solid even when tilted to extremes, although the 16:9 aspect means that a lot of the screen is wasted when taking and viewing 4:3 photos (the default aspect ratio), and when the pop-up flash is attached, this does get in the way of self-portraits. There is a video position on the mode dial, so the record button isn't entirely necessary. Menus – There is an easy way to access all of the features by pressing the middle OK button, this brings up an overlay of controls. The custom menus give you extensive control over settings and options and can seem daunting at first glance, but they can be switched off if you don't want these settings messed with. The custom menus are colour coded, and there is built in help that can be switch on and off. You can also customise the Fn, Video, Right, and Down buttons. Battery life - Battery life is rated at 360 shots according to Olympus / CIPA test results, we were able to take over 450 shots before the battery went flat. Focus, shutter response, shot to shot, and continuous shooting are all excellent, with the only noticeable slowdown seen when using the flash. Switch on time is also excellent. Sample Photos - Face detection works really well, and the camera can be set to give priority to focusing on faces, on the nearest eye, the right eye or the left eye depending on what your preference is. A focus assist lamp helps to focus in low light. Lens Performance - Dynamic range is good and the lens is quite resistant to flare. Exposure is good with bright saturated colours. The 14-42mm kit lens is capable of taking a decent macro photo at the telephoto end of the lens and performs well for a kit lens producing sharp photos right into the corners whether using the lens at the wide-angle end or the telephoto end. Some purple fringing is visible on edges where there is a high level of contrast, although it's not excessive. ISO Noise Performance - Noise is very low at ISO200, ISO400 and ISO800. Noise increases at ISO1600, with a slight loss of detail. ISO3200 images still show a good amount of detail, and the camera still gives usable images at ISO6400. At ISO12800 and ISO25600 there's a noticeable drop in image quality however images should still be suitable for use on the web. 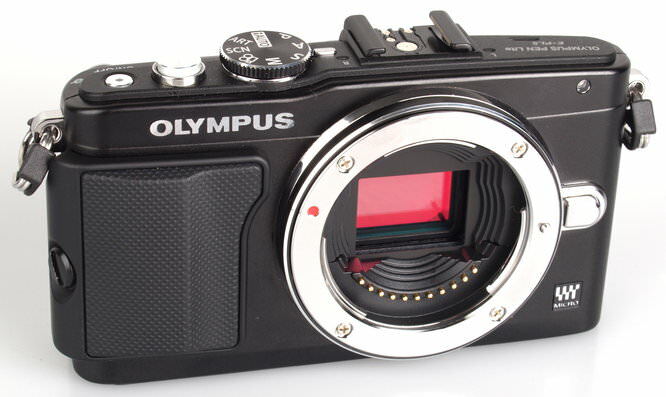 The camera gives almost identical performance as the Olympus OM-D E-M5, as would be expected from the same sensor. White Balance Performance - Auto White Balance (AWB) performs well under tungsten or fluorescent lighting, with the camera giving the option to keep warm colour switched on. The tungsten preset gives a very slight green cast under tungsten lighting, however the fluorescent preset struggled with our fluorescent lighting, giving a magenta cast. For the majority of situations, including mixed lighting the AWB setting produced good results. Digital Filters - There are a vast array of Art Filters on the Olympus camera, 12 in total, with each one having additional options, such as Pop Colour Bright, or Pop Colour Dark. On top of the Art Filters, you can also apply upto 5 other effects (examples are shown above). The "Grainy Film" black and white effect has another set of B&W Filters, as well as B&W Tone options. Panorama mode - The E-PL5 doesn't feature an automatic panoramic mode, instead features a panoramic assist mode to help you line up seperate photos, so that you can stitch them together on the computer later. The camera has a HDR bracketing mode, however the cameras doesn't automatically merge these together, instead you must do this later on the computer. A demo of how live-time works can be seen in our E-PM2 review - this is an excellent feature that is currently unique to the Olympus PEN Mini E-PM2, Olympus Pen Lite E-PL5 and the Olympus OM-D E-M5 and takes a lot of guesswork out of long exposures. Video - The camera has a number of video options, including image stabilisation, colour mode, single-AF, continuous-AF, manual focus, single AF + MF, as well as continuous AF. P/A/S/M modes are available, as well as the option to record MOV or MJPEG. Wind noise reduction is available, as well as three recording volume settings: Low, Standard, High. Another video can be found on our YouTube channel, as well as a video shot in low light using the digital tele-converter. 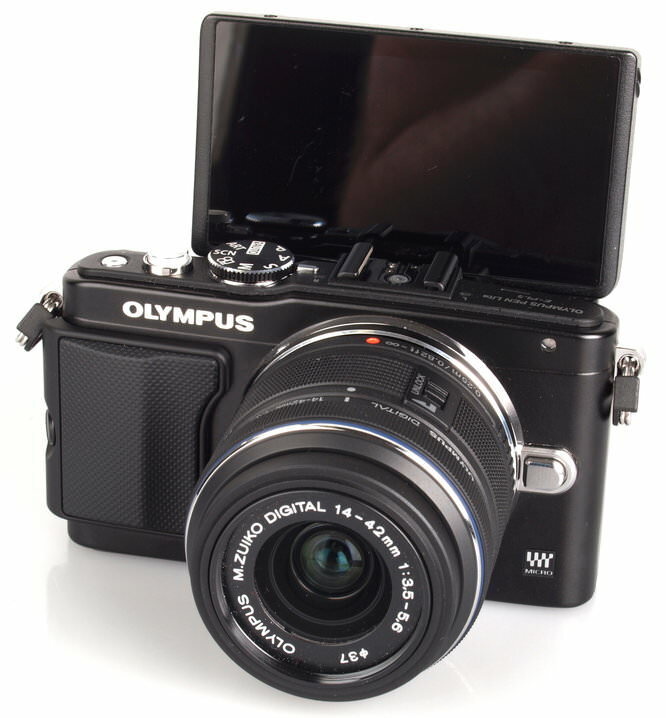 The Olympus PEN Mini E-PL5 is available for £599, (compared to the E-PM2 available for £499), with kit lens, and 8GB Toshiba FlashAir Wi-Fi card, which makes it quite good value for money, and we feel that the extra £100 is fairly reasonable as the E-PL5 gives you the additional grip, tilting screen, and quicker access to controls. As well as the cameras shown above, other mirrorless cameras in this price range include the following (price shown with kit lens): Sony NEX-5R (Wi-Fi), £499, Canon EOS-M, £649, Nikon 1 V2, £799, Fujifilm X-E1, £799 (body only). You'll may also want to buy a memory card and a case or bag to keep your camera safe and protected - have a look at our complete guide to camera bags. 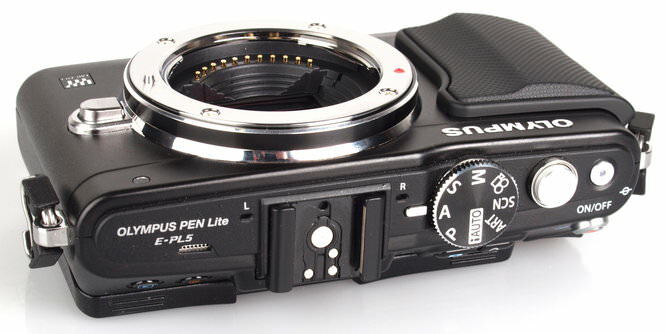 The Olympus PEN Lite E-PL5 features an updated tilting 3inch touch screen, with better handling than the previous Lite E-PL3. The camera doesn't feature a panoramic mode, but does include a built in HDR bracketing mode, although unfortunately this doesn't auto-stitch the photos. The Live Time feature inherited from the Olympus OM-D E-M5 is an excellent feature. The camera's image quality is vastly improved over the previous PEN cameras, inheriting the 16 megapixel sensor from the Olympus OM-D E-M5, and image quality is excellent with the 14-42mm MK II lens delivering sharp photos and excellent Olympus colour. Noise performance is the best it's ever been from a Micro Four Thirds camera, with usable ISO up to and including ISO6400. 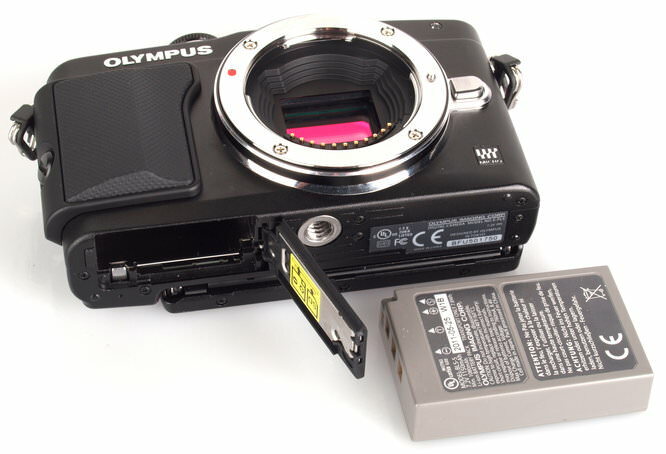 With the current offer on the Olympus PEN Lite E-PL5, where you can get a free FlashAir Wi-Fi card, the camera is very good value for money. The Olympus PEN Lite E-PL5 is the more serious brother to the E-PM2, and with the ever increasing number of lenses available for Micro Four Thirds cameras, the Olympus PEN Lite E-PL5 should be high on your list if you're looking for a mirrorless camera. 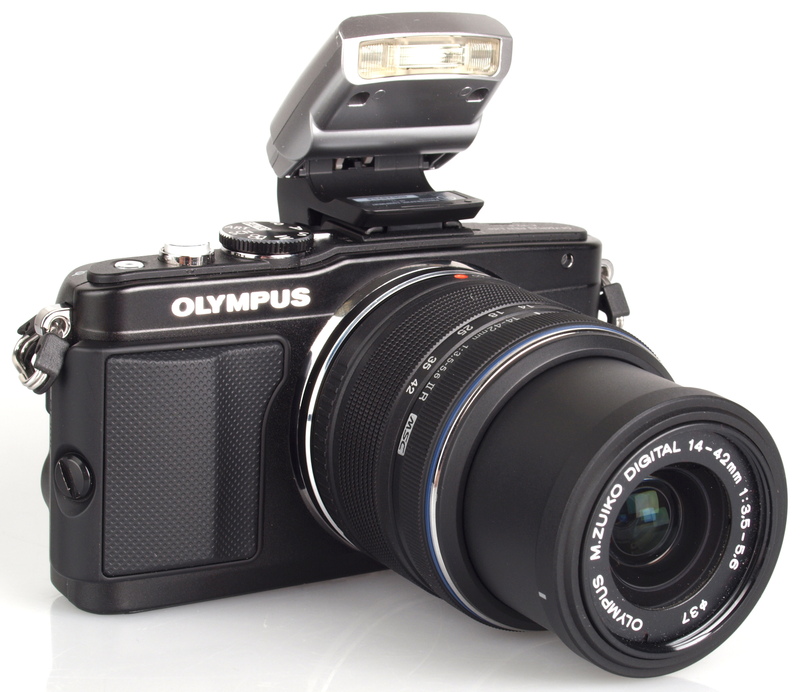 The Olympus PEN Lite E-PL5 is an excellent update to the E-PL3 and one of the best mirrorless cameras available. Thank you for the review. At last, someone has noticed the video tele-converter! I checked the video, but would welcome you comments on how the feature works in practice., ie is it straightforward to use etc. It's quite easy to use, you simply switch it on in the first Shooting menu. It magnifies it 2x and you can also use it for digital zoom in photos. Fed up with lugging a heavyweight DSLR around, wanted a small, go-everywhere camera and the E-PL5 fits the bill. Good colour, if a tad heavy in the shadows [RAW] and good crisp images from the kit lens, with little corner fall-off. Good exposure histogram info and playback warnings for highlights and shadow error. My only minor gripe is that fiddly navigation wheel that must be worked hard in manual mode. On the E-P1 I find that the circular ring around the OK button is easy move accidentally. The E-PL1 appears to have a similar ring around the OK button. Did the Reviewer come across this problem during testing? Also, is the camera significantly faster at focusing? - particularly at low light levels, where the E-P1 falls down somewhat. On the E-P1 I find that the circular ring around the OK button is easy move accidentally. The E-PL1 appears to have a similar ring around the OK button. Did the Reviewer come across this problem during testing? Also, is the camera significantly faster at focusing? - particularly at low light levels, where the E-P1 falls down somewhat. I mean E-PL5 of course.